Once you’ve made the brave and exciting decision to start your own website (and chosen your web host! ), you’ll need to decide what type of CMS (content management system) you’re going to use. There are millions of people using CMS systems to build their blogs and websites, the reason being, they are simple to use, easy to understand, and don’t require any coding knowledge or design experience to make a website look great. Users can customise their websites at their leisure, add content, add images, and even implement fancy features to stand out. The most popular CMS platforms out there are WordPress, Joomla, and Drupal. All of these platforms offer extensive features to create a website, but some offer more functionality than others depending on whether you want a blog, online store, portfolio, etc. There are certain features, of course, that we’d expect to see across all CMS platforms; ease of use, great support, SEO functionality, and flexibility. Across the three popular platforms, WordPress host 75 million websites, Drupal host 1.1 million, and Joomla host 2.8 million. So, I think it’s time to see who’s king of the CMS castle by comparing them against each other! Many people using CMS platforms aren’t web designers or developers, they are users wanting to build a website with ease of use; this being one of the most important factors to choosing a CMS. 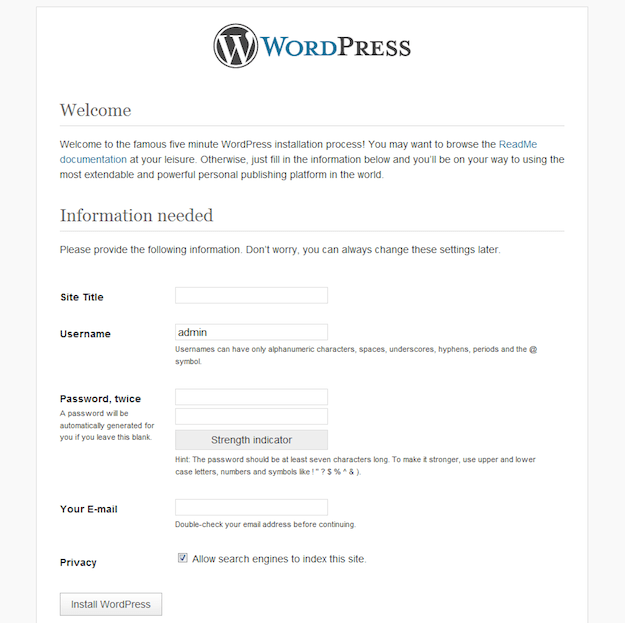 WordPress boasts their famous 5 minute install which does what it says on the tin – really, it does! Many web hosts now offer a one-click install of WordPress too, making users’ life’s a lot easier. So, if you’re new to WordPress, or creating a website, the whole process is simple and easy to follow. Once installed, users are faced with a clean user interface, allowing them to start creating and customising their website from the offset. WordPress’ user experience is far superior to Joomla or Drupal. Joomla’s installing process is fairly similar to WordPress and most web hosting provider’s also offer one-click installs for Joomla too. 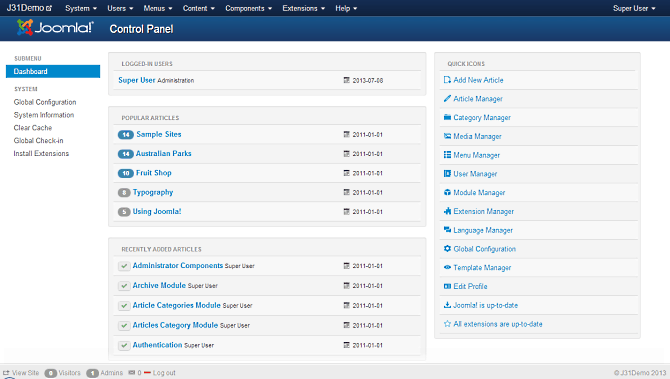 Once Joomla is installed the user is presented with a control panel which is split into a sidebar and a top navigation system which can be slightly confusing to new users. Although the features likely offer more than WordPress, and Joomla is a very powerful system, beginners will probably be a little fearful of it to begin with. 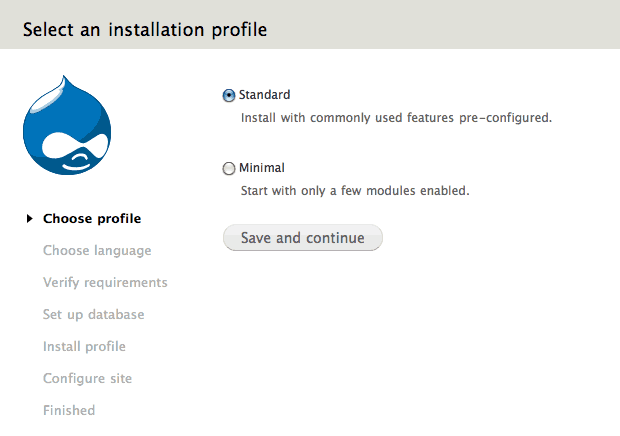 Again, similar to both WordPress and Joomla, Drupal’s installation is pretty simple to download and install. Drupal offer a feature called distributions which is essentially different packages that you can use to create specific websites. The features are collated in a bundle which is very handy. However, new users will likely find it a challenge to figure out how to manage their website to begin with; the process isn’t very obvious unless you know what you’re doing. Themes and addons/plugins help boost your website that little bit further. They enable you to create a fantastic looking website, and offer features that change the way your website works on the front-end and back-end. With WordPress, you can change your websites’ appearance using themes. There is a selection of pre-installed themes, but also a library full of free themes, premium themes, and third party developed themes. WordPress really specialises in plugins; with more than 38,000 plugins available for free, your website will be running all by itself! Check out the 15 Best WordPress Plugins 2017 to get your started. Joomla also offer templates and extensions, from eCommerce to email management, you’ll be sure to find something that works for you. However, the selection is not as vast as WordPress, so you may spend a little longer looking for what you want. Joomla offers an extension manager to easily add and install extensions to your website, but if you’re looking for a templates manager, you’re not going to find one. You’ll need to install your templates manually, so for beginners, this may not be the best option. We encountered a similar issue with Drupal in that they don’t offer many themes or modules. Users are required to search for the theme or module they desire, obtain the project’s zip file URL and then enter the details in the modules or themes page in order to install them. If you know what you’re doing, then Drupal may be an option, however, if you’re looking for a wide variety of themes and modules to use on your website, the selection with Drupal is a little lacklustre. Customer support is often a high priority for beginners when trying to navigate new software; there will likely be challenges or questions that arise, so support needs to be on hand when a user requires it. WordPress has been around for some time now and has generated a high population and strong community of users. 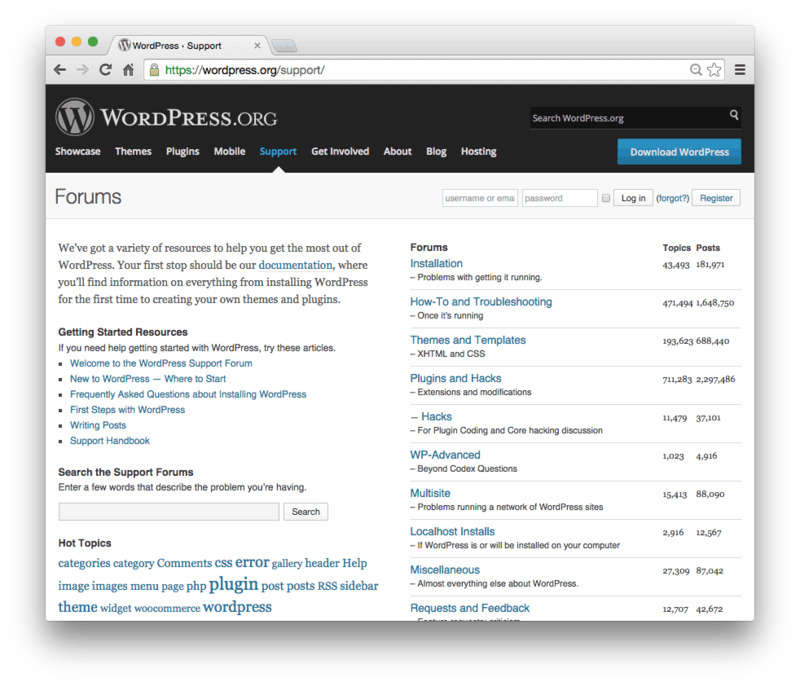 There are official support forums, documents, stack exchange links, and tutorials all over the internet for WordPress. You do also have the option of paying for support from various online channels like Upwork and Fiverr where you can hire a WordPress professional freelancer. You’ll likely find a very experienced developer at an affordable price, so if you’re willing to pay, you’ll be able to obtain the support you need. 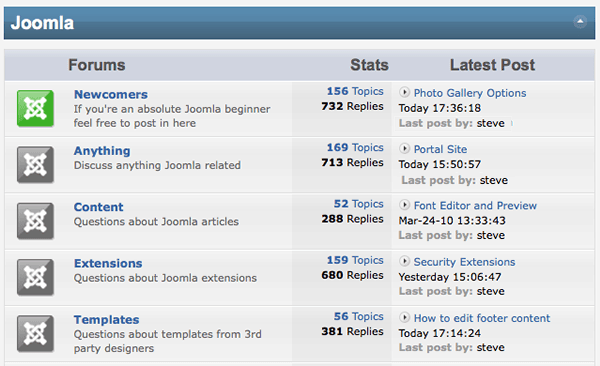 Similar to WordPress, Joomla has a large online support community willing to help you at every turn. There is a large selection of documentation available, too, providing valuable resources for beginners. The downfall with Joomla is that there are not many Joomla experts available, so finding them can be difficult. Because they are of a rarer breed than WordPress, Joomla experts can often be costly so if you can’t find what you need in the online community, you may be clutching at straws. 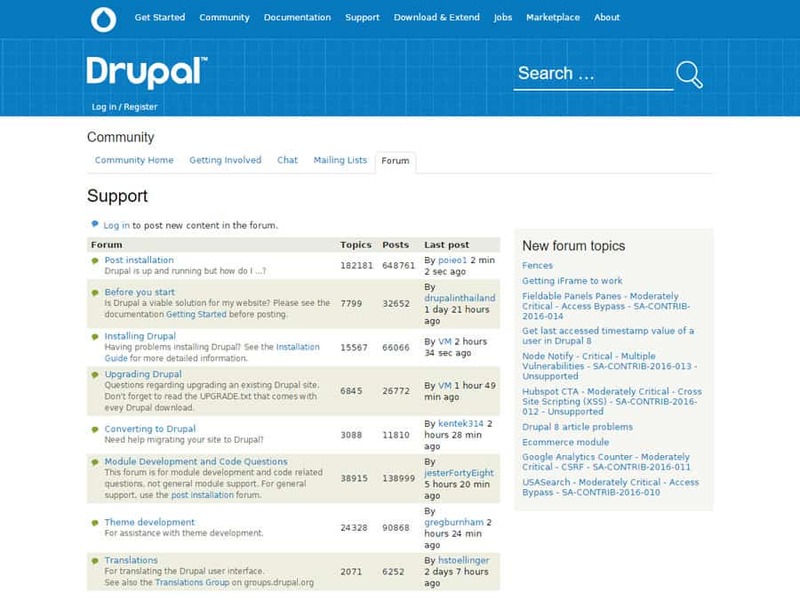 Drupal offer a very active and helpful support network, including, forums, community documentation, IRC online chat, and answers across the internet. Although there’s a lot to offer, you’ll often find that Drupal pushes you towards professional services available to the Drupal marketplace which are paid services. Security is an absolute must for every website, so choosing your CMS platform based on this is entirely reasonable. All websites on the internet are vulnerable to security threats, so it’s important to find ways to minimise or even eliminate these. Seeing as though it’s the most popular CMS in the world, it’s not unusual to suspect that WordPress is a prime target for hackers. However, the code behind WordPress is incredibly secure; whenever a new security patch is released, there’s an auto-update function built into WordPress, allowing all of their websites to update automatically. WordPress offers back up functionality, too, as well as two factor authentication and much more. If a theme or plugin has an update, you’ll be reminded of this very promptly. Developers will be on hand to update their files to ensure they are not at risk of security vulnerability. Joomla are quick to respond to security threats and provide updates often. However, it is up to the user to install updates to their website and maintain it. You can combat this by installing back up extensions and explore the community forums for more security tips and tricks, similar to WordPress. If a security threat is present, Drupal will publish this on their website to make it known and will respond to the threat extremely quickly. There is a security handbook which users can refer to, and a security team on hand to help with any security issues or reports you may have. After reviewing some of the important features of each CMS, we’re going to take a look at the overall pros and cons of each one. It’s important for us to provide you with all of the information possible to make an informed decision! Although we’re looking at the three most popular CMS platforms available, each of them will have their downfalls, simply because others out there may offer an alternative. WordPress, Joomla, and Drupal are great and extremely popular content management systems. Although Joomla and Drupal have some fantastic features, WordPress is by far the easiest system to use, whether you’re a beginner user or an expert. WordPress’ community is absolutely huge, offering thousands of free themes, plugins, and more, making WordPress our choice for the best content management system of 2017.